Kyoto, Japan – November 20th, 2017 – Questetra, Inc., the global SaaS provider of Business Process Management (BPM), today announced that they have published the new version 11.5 of the Cloud-based Workflow product “Questetra BPM Suite” on Nov. 20th, 2017. 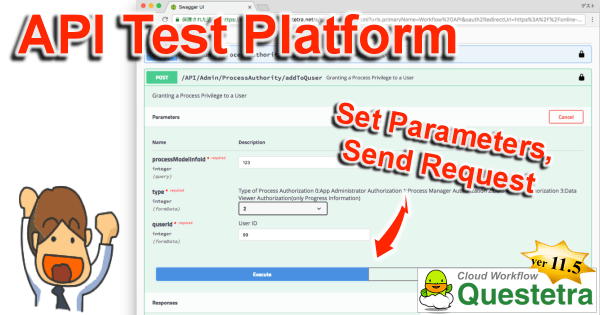 With this new version, it allows users to easily implement API collaborations and self-development, since the API documents and REST API testing environment have been organized to which conforms to OpenAPI specification (formerly Swagger). In order to improve the productivity of day-to-day operations, automation of Business Processes is essential. Since numbers of cloud service company publishes APIs (Application Programming Interface) which are for accessing resource of their own services, cases of “self-development of app using API” or “API collaboration between multiple services” are increasing its number. On and after the new version 11.5, you can promote not only automatizing request transmission to external systems (external APIs) using “Auto step”, but also automatizing requesting from external systems to the Workflow platform. For companies that utilizing multiple cloud services, Questetra can be the core cloud service. It is an online document generated dynamically according to Workflow platform. It allows developers to write program code that suites for their own Workflow platform efficiently. In addition, since communication test of request can be executed within online document, it is possible to create program code while simulating various data transmission. In addition to the existing “Each task is finished when one of the allocated user has executed”, you can set an option of “Each task is finished when every allocated user has executed”. It is useful in a situation where all the operators must see. Enabled to set “Authentication lifetime” in ID Provider setting, so that you can use Google as the ID Provider. Also, adopting encryption that can be used as certificate, it supports more advanced algorithm. Email transmission from Questetra BPM Suite corresponds email encryption. It allows secure email transmission if the target email server supports STARTTLS.